Isaac Franklin (May 26, 1789 – April 27, 1846) was an American slave trader and planter. He was the co-founder of Franklin & Armfield, which became "the largest slave trading firm" in the United States. It was based in Alexandria, Virginia, and also had offices in New Orleans and other Louisiana cities. He owned six plantations in Louisiana and Tennessee. Fairvue, in Sumner County, Tennessee, is listed on the National Register of Historic Places. By 1841, Franklin was out of slave trading and devoted his energy to the plantations and other property interests. At age 50 he had married for the first time, to Adelicia Hayes of Nashville. None of their four children survived to adulthood. In the late 19th century, his widow eventually sold the Louisiana plantations. In West Feliciana Parish, his former Angola and other plantations were bought by the state in 1901 and converted for use as Louisiana State Penitentiary, the largest maximum-security prison in the United States. Isaac's mother was Mary Lauderdale. James Franklin prospered in Tennessee—as each of his sons reached adulthood, he presented them with a horse, a bridle and a pocket knife. When Isaac was twenty-one years old, he received his share and, according to tradition, used the knife to carve a ship miniature. He sold this to a friend for one dollar. In fifteen years he had made a fortune in slave trading. Franklin took up slave trading in 1810. After serving in the War of 1812, Franklin resumed the trade. The Franklin and Armfield Office in Alexandria, Virginia. Franklin formed a partnership with his nephew John Armfield. From 1828 (when Isaac's father James died and bequeathed land and slaves to Isaac and his brother James) to 1837, Franklin & Armfield became "the largest slave trading firm" in the United States. They set up their business in Alexandria, Virginia (then part of the District of Columbia). Franklin also had offices in New Orleans, the major slave trading center in the South, St. Francisville, and Vidalia, Louisiana. The domestic slave trade in those years moved more than one million slaves from the Upper South to the Deep South, where large cotton plantations were developed that needed large gangs of slaves for labor. The firm owned six ships to take slaves from Alexandria in the coastwise trade to the Deep South. The ships returned with cargoes of sugar, molasses, whiskey, and cotton. The Fairvue Plantation house, near Gallatin in Sumner County. 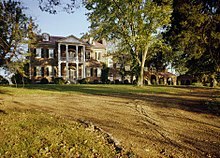 Franklin made his Tennessee plantation, "Fairvue," his home. Once Fairvue was finished, he turned toward Louisiana where he purchased six plantations, named "Bellevue", "Killarney", "Lochlomond", "Angola", "Loango" and "Panola". He also bought thousands of acres of land in Texas, as well as a turnpike, bank stock, and a third interest in the Nashville Race Course. In 1835, Isaac Franklin eased out of active slave trading and, by 1841, he was completely out of the business. After his marriage, Franklin concentrated on managing his Tennessee and Louisiana plantations, and other property in Mississippi. When he died in 1846, he owned 10,000 acres (40 km2) of land in Louisiana and more than 600 slaves. 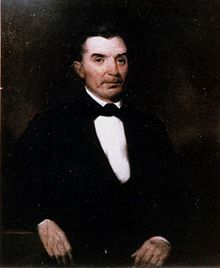 In 1839, at the age of fifty, he married Adelicia Hayes (1817–1887), the daughter of Oliver Bliss Hayes (1783-1858), a lawyer and a Presbyterian minister, and Sarah Clemmons Hightower (1795-1871). They had four children: Victoria, Adelicia, Emma, and Julius Caesar. All died in early childhood. Upon his death in 1846, he left her his slave trading fortune, plantations and slaves. She later married again, and had Belmont Mansion and its estate built in what was then country outside Nashville in 1853. Isaac Franklin died on April 27, 1846 in West Feliciana Parish, Louisiana. His corpse was preserved in alcohol and he was taken to Fairvue. By a will he made in 1841, Franklin made a bequest to endow a school or seminary at Fairview. The will was the subject of protracted litigation by his nephew and former partner Armfield. Similarly the will of Stephen Girard in Philadelphia was contested, but his bequest was ultimately used to establish the Girard Academy for poor boys. His widow sold Fairview to William Franklin for $30,000 in 1848. She remarried the following year. She leased and later in the 19th century sold the Louisiana plantations to Samuel James, who leased convict labor (mostly African-American men) from the state to work them. The state acquired the merged plantations under the name Angola in 1901; this land was used for the development of Angola Prison. ^ a b c d e f g h i j Gudmestad, Robert H. (Fall 2003). "The Troubled Legacy of Isaac Franklin: The Enterprise of Slave Trading". Tennessee Historical Quarterly. 62 (3): 193–217. JSTOR 42627764. ^ a b c Kenneth C. Thomson, Jr., "Isaac Franklin was a Well-Liked Slave Trader," in Gallatin Examiner, Thurs. May 13, 1976. Wikimedia Commons has media related to Isaac Franklin.